I do like collections such as this one, where pianists indulge themselves – and their listeners – with a selection of musical sweetmeats. Of course, the menu needs to be chosen carefully if it’s not to sate too soon, a happy medium achieved in Piers Lane Goes to Town, Philip Martin’s A Maiden’s Prayer and Hough’s The French Album. All three are imaginatively presented – the order of courses is crucial, too – and served up with all the skill and discernment one expects of these fine artists. Stephen Hough: In the Night, with pieces by Beethoven, Chopin and Schumann, is more serious stuff, designed to satisfy in other ways (CDA67996). 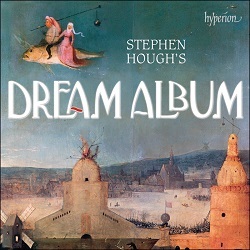 However, what unites both that and the Dream Album is the presence of works by Hough himself; the latter also includes a number of his transcriptions, drawn from a variety of cuisines. I confess most of these titbits are unfamiliar, although I did spy some substantial Liszt in among the trifles. And then there’s mine host, the estimable Hyperion, known for keeping a very good table. At nearly 80 minutes of music, there’s no skimping on quantity, either. Even a quick sampling confirms the affable mood. That said, Hough doesn’t let standards slip, giving all due attention to even the smallest dishes. Perhaps there are a few too many of those, and their flavours don’t vary that much. Still, there’s some witty conversation at the board – the faux serious quote at the start of Solovyov-Sedov’s Moscow Nights will raise a knowing smile or two – although anyone in search of the real thing will be mightily impressed by Hough’s account of Liszt’s Harmonies du soir. As it happens, I’ve just been listening to Kirill Gerstein and Daniil Trifonov in these taxing studies, and Hough is every bit their equal in terms of shape, power and insight. Simon Eadon’s full, fearless recording is excellent, too. Elsewhere, he’s unfailingly adroit and elegant, modulating from floridity to finer feelings and back again. Also, there’s nuance and a sure sense of style, as in Albéniz’s rather lovely Capricho Catalan, the natural, well balanced sound a treat for even the most jaded palate. Although some of Hough’s own pieces, Niccolo’s Waltz for instance, have an improvisatory, bitter-sweet quality, that’s countered by the good humour of pieces such as Osmanthus Romp. And if you’re a little tipsy after so much good food and good wine, the gentle lapping of Coates’s sleepy lagoon might just, well, tip you over. If it doesn’t, Hough’s two lullabies surely will. At the end of this delightful evening, everyone would surely be in the mellowest of moods, perhaps just a little reluctant to take the proffered coats and the waiting cabs. Something to tickle every taste-bud; bon appétit!